With as great a product as the underground Lifesaver storm shelter is, why would we now be promoting another storm shelter/safe room product? First of all, if you’re searching for a product that can keep you safe from severe weather underground, the Lifesaver Storm Shelter is exactly the underground shelter you’re looking for. It exceeds all FEMA guidelines and has a lifetime warranty so you know it’s safe; it’s comfortable and clean on the inside thanks to it’s fiberglass build and brilliant-white epoxy gel coating; it’s flat and doesn’t stick out in your yard like a sore thumb like some other storm shelters; it’s easy to open, get in and secure and it’s also very affordable, starting at $3,500 for our LS-4 Lifesaver storm shelter INSTALLED! So you can’t go wrong in choosing one of our Lifesaver underground storm shelters for sale. But what if you’d prefer to be in a storm shelter above ground? What if you have some extra space in your garage suitable for a sturdy, solid, steel tornado safe room? What if you have difficulty moving around or have a wheelchair, walker or cain that you rely on? What if in addition to providing protection and shelter from the storm for you and your family (from a Huntsville tornado or a Tennessee tornado for example), you’d also like to store your valuables and important possessions? What if you’d like the option to have protection from fire, theft or even bullets? If any of these scenarios have run through your head, perhaps you should also look into one of our All Weather Safe Rooms (which happen to be primarily designed as a tornado room or tornado safe room, also exceeding FEMA guidelines and testing requirements). You see, an above ground safe room is like a big safe AND a storm shelter all in one. For the majority of the time you can store your guns, weapons, precious metals, jewelry, family heirlooms, important documents and computer data, etc to protect them from burglers, bullets and fire. However, when severe weather approaches and your [email protected] custom alert service notifies you that a storm is headed directly toward your home, YOU can also take shelter from the storm in your safe room (enter your information into the form on the top right of this page to get [email protected] for FREE as a visitor to our website). This tornado safe room can be installed as a hidden room as well (for new construction homes) where most people will not even know about it, hidden behind a fake wall or door. Most installations however are done after the home has been completed (requires a slab foundation for anchoring the tornado safe room to your foundation and enough access to place the safe room in it’s place to be installed). For this reason, we install most safe rooms in the garage or even on the back concrete porch if there’s too little room in the garage (safe rooms start at 4 feet by 4 feet by 8 feet tall – visit our tornado safe room page for full details). Some of our customers who desire extra protection and peace of mind have chosen to even install both an underground shelter with one of our All Weather tornado safe rooms over the entrances to their underground storm shelters. Now, as far as protection from severe weather like tornadoes, this is overkill. One or the other would protect you from a storm. But if you wanted the additional space underground and the advantage of being protected from bullets and fire and having a place to store your valuables, you’ve got it all in one place. Again, for most people this is not necessary, but it something we can do if you like (see photos below). We want to help you and your family stay safe in severe weather. 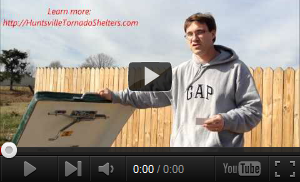 Get Your Tornado Survival Kit Here!